I’ve discovered another insect in New Hampshire that I never met in Virginia. At first I thought it was an unusual Japanese beetle but, no, it’s a relative… same size but different markings. 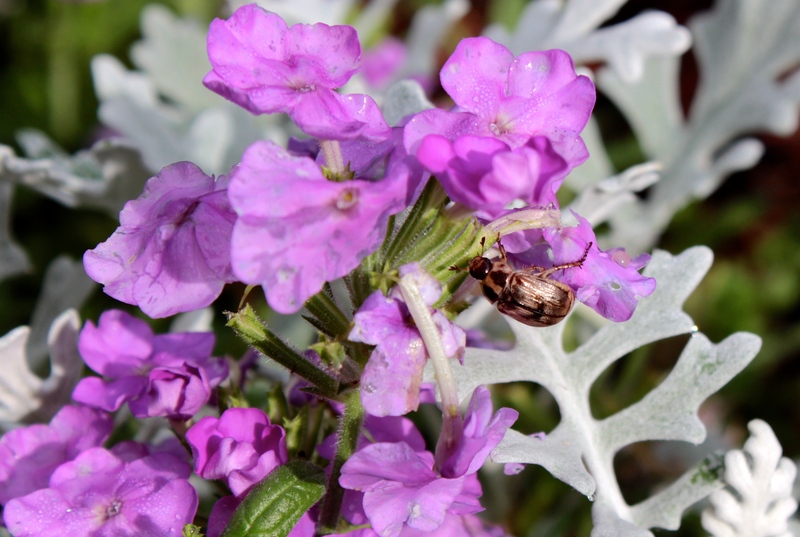 According to UNH Cooperative Extension, this is the invasive Asiatic garden beetle or Oriental beetle (Exomala orientalis) that was first discovered in the US in the early 1920’s. It is found in most of New England although it has moved as far as South Carolina and west to Indiana and probably still spreading. It feeds off the roots of grasses as a grub and the adult can attack garden plants. I think it’s actually kind of a cute looking little beetle… and “about the size and shape of a coffee bean,” says cooperative extension. 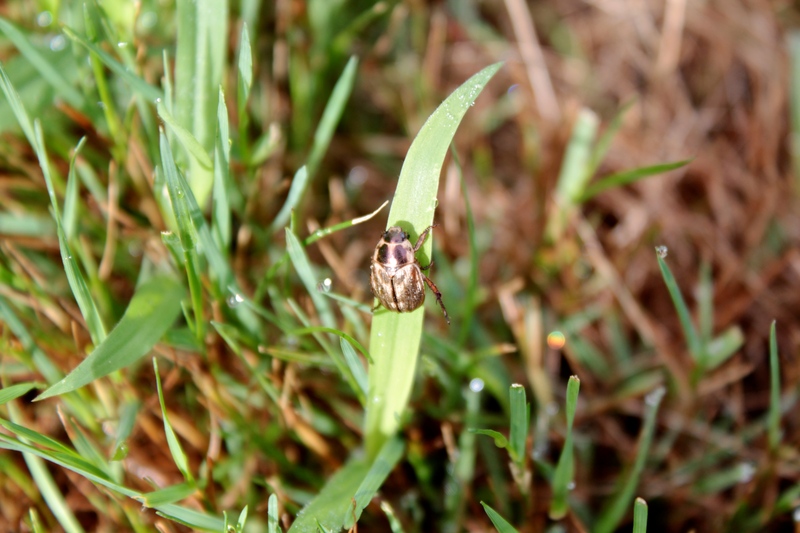 Cute looking, but does damage as a grub to the lawn, then in June and July, it emerges from the soil to mate and eat. Adults generally eat little but stick around all summer nibbling in the garden. After mating, the females burrow into the soil to lay eggs that hatch in about 2 weeks. UNH states that rarely are chemical controls needed for these grubs in New Hampshire. Japanese beetle grubs in this state are more destructive than the Asian beetle grubs, however the USGA says it’s the most important white grub species in turfgrass in New Jersey, southeastern New York, Connecticut, and Rhode Island and causes major damage in ornamental nursery stock. I do not see damage on many leaves or blooms in our little gardens. I’ve read that favorite foods are leaves and the petals of daisies, hollyhock, roses, phlox, petunias, sugarcane, and blueberries, cranberries, raspberries, peaches and sweet potatoes. Whew! I don’t have any of those! 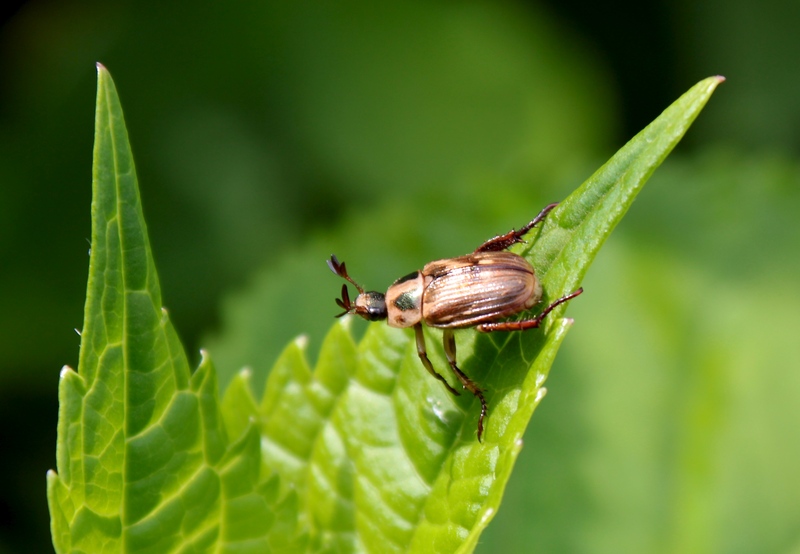 Often overlooked in the yard because they are not good flyers like Japanese beetles and are nocturnal, doing all flying and mating at night. An Integrated Pest Management system that traps and disrupts mating with an in-ground pheromone lure for the adult male beetle may be my solution if it gets worse. The lures are good for 6 weeks but must be emptied weekly. I wonder what new insect I’ll meet next….